If you spend any time at all on Pinterest, you are bound to experience something I call food shame. You see those gorgeous photos of every kind of recipe imaginable – and that just sets the bar really high. I mean, I like to cook but I just can't churn out these amazing dinners each and every night. So, today I am giving you permission (or maybe I am looking for permission 😉 ) to take a shortcut. Because you can make a fantastic dinner – even if it isn't entirely done from scratch. Take these homemade chicken fajitas for example. My son was home from college this past weekend, and my typical lunch – which is usually a yogurt or something leftover – wasn't really going to fill him up. So it was lunchtime and I was looking for something quick that I could make that was somewhat healthy and would satisfy. and a package of Old El Paso fajita seasoning mix (no this post is not sponsored by Old El Paso – they don't even know who I am). Yes, I did have all that stuff on hand because I made fajitas for dinner earlier in the week as well. 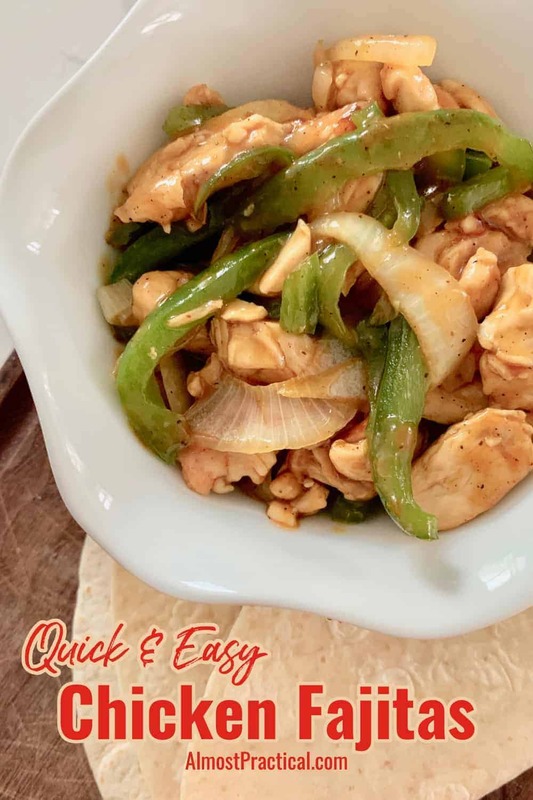 We didn't have a lot of time, but I offered up fajitas – and my son was pretty surprised that I would be able to whip them up quickly. That is the magic of shortcut, isn't it? To make these homemade chicken fajitas you just cut up the chicken into tiny pieces. Thinly slice the onions and the green peppers into long strips. Brown and cook the chicken pieces in a non stick skillet over medium high heat. Once the chick is cooked, add in the water specified on the seasoning packet, toss in some sliced onions and green peppers, and cook over medium heat for about 4 to five minutes more. If you really want to take it up a notch you could add in a drop of liquid smoke, but you really don't have to. It took me around 15 minutes from start to finish. It beats a ho hum sandwich any day. 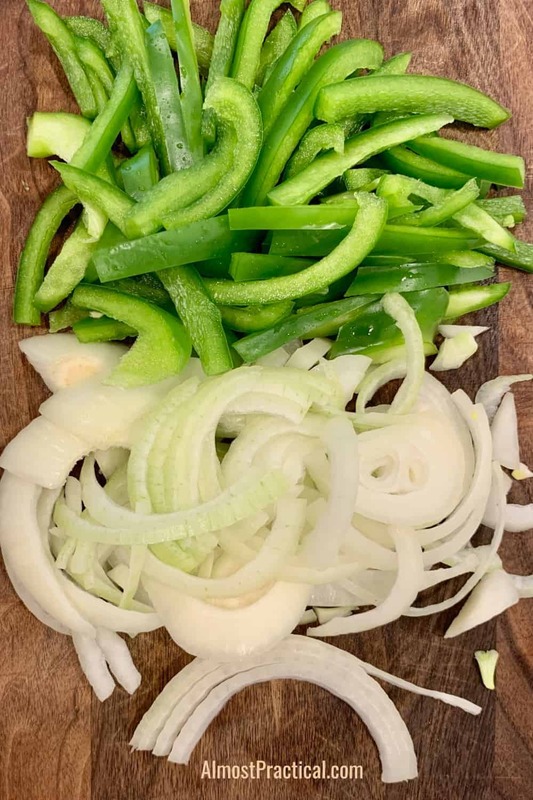 And all those fresh green peppers and onions are a great way to sneak in a serving of vegetables. I get it – mixing up your own seasonings could be better for you because you have more control over what you include. do you have a premixed homemade fajita seasoning ready to go whenever you are ready to cook? if you mix it up on demand will you be able to make your meal quickly if needed? will your people like the mix you put together from scratch? If you did not have a ready made seasoning packet on hand, would you have made a different and possibly less healthy lunch choice? For me the last question is the most important because it is easy to make bad food choices when you are short on time. 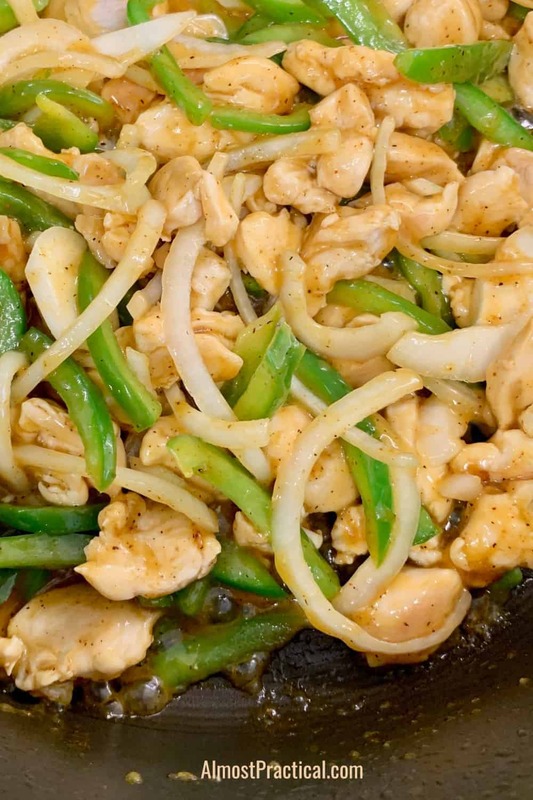 So, my point is that it is ok to take a shortcut – like I did with these homemade chicken fajitas. Not everything you make has to be entirely from scratch, despite what you see on Pinterest. And your family will appreciate it.